The stunning return of Jean Claude Duvalier last Sunday without a doubt struck the hearts of many across the world. However, there are people in Haiti—in position of power—who appear quite coy to the idea of arresting the dictator and force him to face the long awaited justice for crime against humanity. Immediately after the arrival of Duvalier, René Préval was accused of masterminding the tragie-comedie. 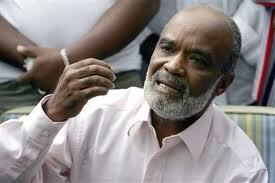 It sounds simplistic and even dumbfounded to believe that René Préval, a man who came to power by virtue of “social justice” could allow himself to go down in history as the Haitian president who betrayed his fellow countrymen, who left them at the mercy of Providence and who engineered the return of the man who forced Haiti down to its darkest era and who by far symbolizes the main pillar of evil-doings in modern day Haiti. On this one, though, the people may be right. The hours succeeding the arrival of Duvalier were felt like emerging from the devil trance, feeling dazed and utterly bewildered. Who issued the assurance to Baby Doc? With all intellectual probity, it is not easy to pinpoint the agent or agents who issued the feuille de route to Jean Claude Duvalier and his wife Veronique Roy. The French government cannot be put off the hock either, for in proxy politics, super power rivalries can lead competitors to wild swings. It is hard to imagine that Jean Claude Duvalier boards an airplane in Paris bound for Port-au-Prince without the knowledge of the French government. And if they knew and let him loose, it must be for a reason—a reason perhaps that perfectly coincides with Préval’s strategic interests in the aftermath of the last elections in Haiti. France’s top diplomat in Port-au-Prince, Ambassador Didier Lebret, has been quite evasive. “Certainly the presence of Mr. Duvalier is not helpful at a time the country is trying to recover from a heavily disputed presidential election,” he asserted, as he was answering questions to journalists. But when questioned as to how his country let the dictator come in the first place, he remained visibly aloof. “The French government did not let him go, no one knew of it until he was already in the plane,” he told a journalist of France 24. If France did not get advance notice of Duvalier’s move, the receiving end must have gotten it. In this regard, the president of the republic of Haiti owes his people an immediate explanation. As always, he is out of sight, and one has all the reasons of the world to believe that Préval will not speak to the nation on this issue. It was the same posture that he took in the wake of the earthquake that left more than a quarter of a million Haitians dead and close to 2 million internally displaced. As a conformist politician, Préval will play any French card to get what he wants, especially if he feels the Americans have already turned their backs on him. There are ample reasons, however, to think that René Préval, in fact, has an interest in having a notoriously distracted figure like Jean Claude Duvalier in Haiti at a time when the country’s political future is uncertain and all eyes are fixated on him. It has been some time since René Préval, despised by the vast majority of the population, has been trying to secure an honorary exit out of the presidency. He fears of going to prison should he be prosecuted by the person who will replace him, and the prospect of dying in exile dreads him to the core. Playing the domino, Préval is now rolling the dice. Jude Celestin, his handpicked candidate has already lost the train, although officially he remains in the frame of the presidential runoff. Conventional wisdom dictates power politic—a logic Préval understands too well. So the fight, now, is not to win on behalf of Celestin, but to keep Sweet Micky out of the race so assure a Manigat win thereby insuring his wishes. Manigat’s interests and that of Préval are now mutually inclusive. To win the presidency, Micky must be kept at bay, which Préval hopes to deliver. Fighting to keep Micky away from the race, he really is, even if he has to sign Machiavellian pacts with the devil. By accepting to play his role, Jean Claude Duvalier must have been guaranteed something. Could it be an insurance to remain in the country, away from persecution? It has been reported that Jean Claude Duvalier is suffering from poor health, and his wish is to die in Haiti. He obviously looks sickly. His dull face gets swollen, looking stocky as he walks in erratic steps. He looks quite old for his age, only 59. But even a dying Duvalier is a dangerous precedent for the country. His presence is just enough to embolden his diehard Duvalierists, who are now demanding that Duvalier be entered the presidential race. But Préval’s silence may not just be a reflection of his natural demeanor. It may have been because of his relations with a number of notorious Duvalierists, who occupy important functions in his government. Jean Robert Estimé, one of the most important figures of the Jean Claude Duvalier regime, is Preval’s main advisor—so close to Préval that rumors had it that it was Estimé, not Celestin, who was going to be Préval’s candidate. Remember the quartet—Jean Robert Estime, Roger Lafontant, Jean-Marie Chanoine and Theodore Achille— during the Duvalier era? Toto Cinéaste, Haitian Ambassador to the Dominican Republic, was one of the major pillars of the Duvalier regime. Rony Gilot, another important figure of the Duvalier regime, is Celestin campaign manager. Sadly enough, the Haitian people are the real losers. Who will save Haiti from the grips of these savage hawks? The San Salvador may not be in sight, but Haiti will rise again, although it might take several generations for this dream to materialize. All that the people of Haiti want is that their rights and their human decency be respected. Right to an education, right to a good job and right to a decent healthcare are what they are dying for after 25 years of democratic struggles. But Alexis, Roumain, Chauvet and others believed in a rejuvenated Haiti. Let their spirits be the guiding light in the dark path to liberation.